The anchor design was the first of many decisions to “overbuild” things related to this treehouse construction project. If I was going to spend time dangling off a rope 30 feet in the air, I wanted to have a bomber anchor. 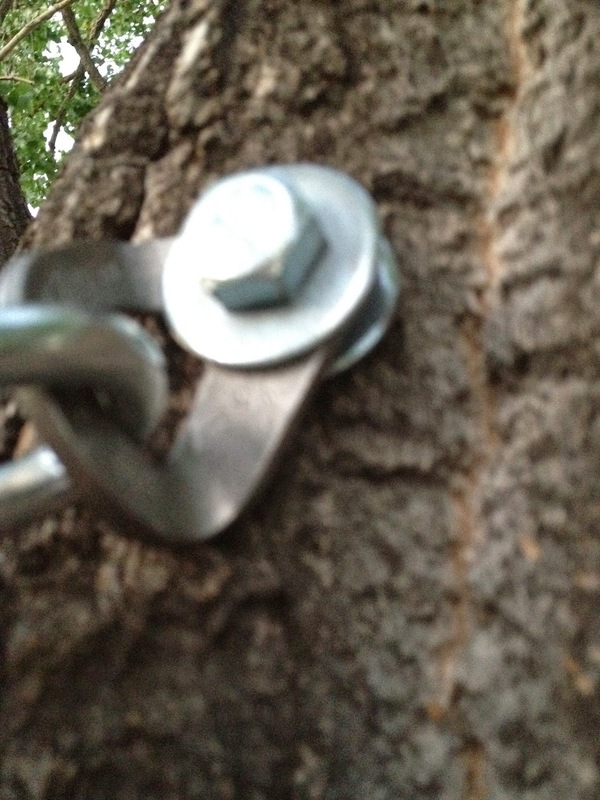 My final installation was a pair of Fixe Hardware stainless steel bolt hangers, lag bolted into the tree with some very long (about six inch) half-inch bolts I’d picked up at Habitat for Humanity. Boy is this picture blurry. It's a little tough to take pictures when you're mostly trying to keep from falling out of a tree or dropping your stuff. 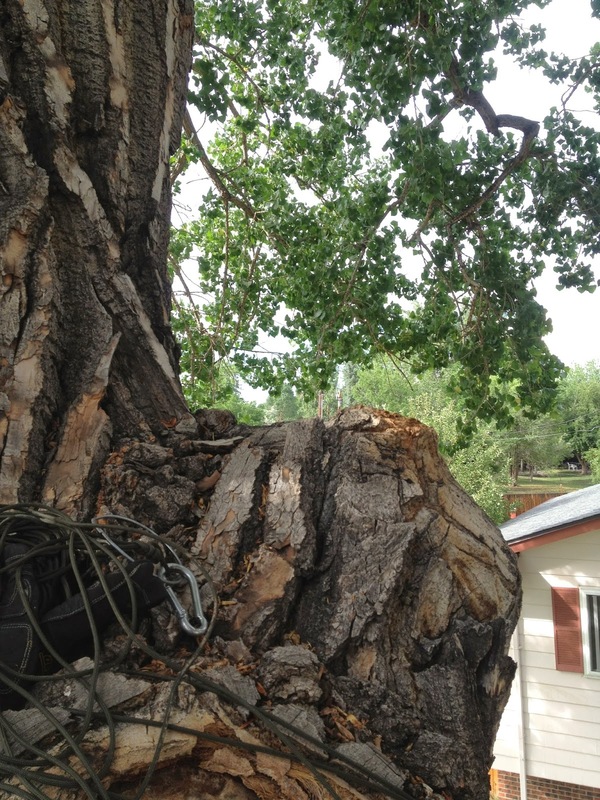 The washers put a little space between the hanger and the bark, which is likely to grow over the years. From each of these I had chain that extended down about 20 inches in a V-shape, where there were a pair of locking carabiners (with their gates facing in opposite directions) through which my rope would run. Serious overkill. Just the way I liked it. Once I had a good fixed point, I needed to perfect my ascending and descending routine. Just about every way I had to get up and down left me almost too exhausted to do any real work at the top. 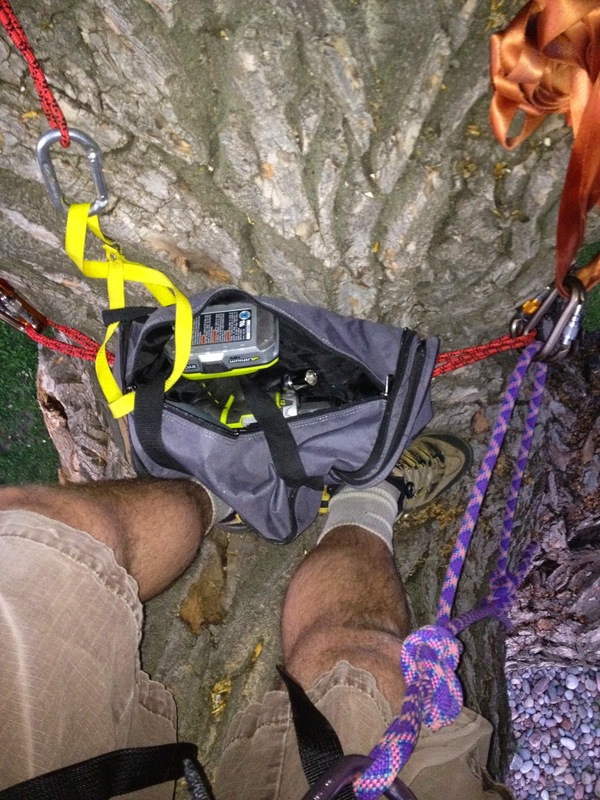 My breakthrough moment came when watching an arborist video; he’d looped the rope around a second time to get a 2:1 mechanical advantage going up. I did the same, with an ascender and a prussik cord. I did everything I could on this project with figure 8 knots, because I knew I could tie them reliably and count on them to keep me safe. Here's a look at what became my morning knot-tying routine. Clear as mud, I'm sure. I clip into the loop on bottom left. If it seems a little intentionally vague, it's because you'd be best figuring out your own system that's right for you and your comfort levels. This photo might be a little difficult to get, but the gist is I’d pull down on the free end while thrusting my hips forward; the little green prussik would advance the ascender up the line. I’d take a few steps up the tree and do it again. Once at the top I’d clip myself into another anchor point (or two) while I worked. When I was ready to head down, I would take out my ATC friction device, insert it onto the line, detach my ascender from the rig, and safely rappel to the ground. The system worked great; when I went up, I always had my ATC with me, as well as a couple of prusik loops just in case things went sideways and I had to get creative. Fortunately I never had a real emergency, e.g. we never had to call the fire department to come rescue the crazy treehouse guy. My work area, the crook of the first split off the northern main branch. Here I'm still anchored by webbing while I drill and place the lag bolts for the permanent anchor. And yes, shorts. It was hot. This picture demonstrates one of the shortcomings of working 30 feet in the air: you have to bring all the tools you need with you, or else you get to use a lot of energy going back down and pulling yourself up again. After a few round trips, I got pretty good at thinking out everything I needed before starting up. Often I’d just tie a bag to the end of my rope and pull it up after I got in place; sometimes if I needed several things, I’d tie them on the rope about 30 feet apart, and pull one up after the other. This little knob is on the other side of the northern main branch from my anchor; I'm standing in the main crook to take this shot. I ended up standing on this knob an awful lot over the course of the treehouse project. 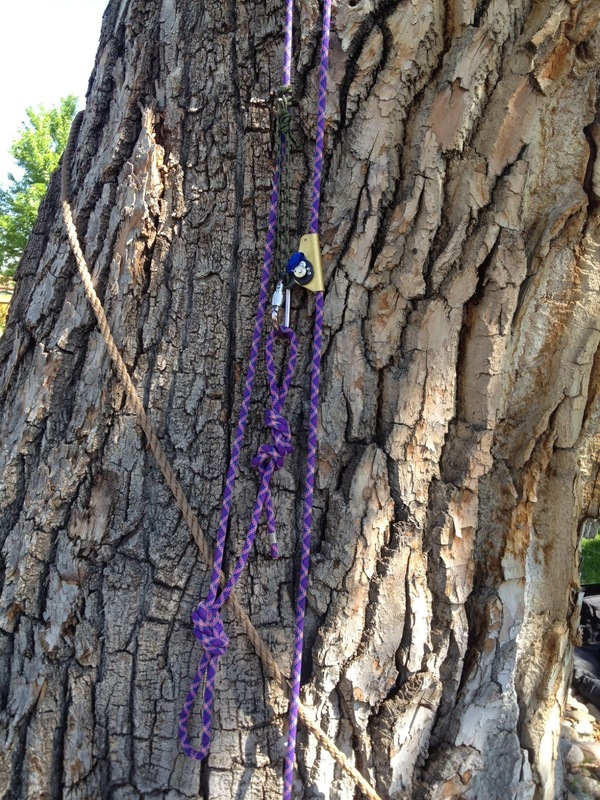 As this knot of green parachute cord demonstrates, it’s not a particularly good thing to use in a bark-covered tree. It’s plenty strong, but it catches in every nook and cranny it can find, and at the most inopportune time. I stuck mostly with using climbing rope whenever possible — easy enough on the hands, strong, and it wouldn’t snag unexpectedly. Mostly. With the basic mechanics of getting in and out of the tree taken care of, it was time to take some measurements for the treehouse support beams.